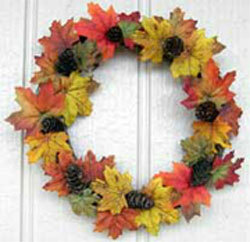 You can make a fall grapevine wreath with the wreaths that you have made or else you can get them at craft stores. The wreath pictured here was made with leaves and pinecones. You can use different kinds of leaves. This one was made with fall maple leaves. All you need is a little imagination and some craft supplies. Notice the many varied colors the leaves have. I enjoy the seasons by making a wreath for all of them and this is one of my favorite fall crafts. Arrange the leaves around the wreath in the design that you want them. Use the glue gun and glue each one down one at a time. Lay the pinecones around the wreath and glue them on. You donâ€™t want to put to many on because it will take away from the leaves and that is what you want to stand out the most. Make a bow with your ribbon. The best way to secure it to the wreath is with wire. Just wrap the wire around the middle of the bow and bring it to the back and hook in on the wreath. Take about 4 inches of wire and make a look with it. Attach it to the back of the wreath for a hanger. Your fall grapevine wreath is now ready to hang. They are a lot of fun to make and will last for many years because you only use them in the fall. Many people think of wreaths just for winter but you can make wreaths for every season. When winter comes just put up your Christmas wreath and store the fall one.